Cut the cauliflower into quarters. Use a grater to 'rice' the cauliflower into small rice-like pieces. Add the riced cauliflower, 1 tablespoon of vegetable oil, and 1/4 cup water to a large pot or large skillet with high sides. Cook over medium heat for 5-10 minutes, stirring frequently. The cooking time depends on how cooked you like your cauliflower. 5 minutes will yield crunchier cauliflower 'grits,' 10 minutes will get you softer cauliflower. Stir in the shredded cheese and continue to cook and stir until the cheese is melted. Season with salt and pepper, if desired. Heat the remaining tablespoon of vegetable oil in a large skillet. Add the seasoned shrimp and cook about 2-3 minutes per side over high heat, or until the shrimp is fully cooked. 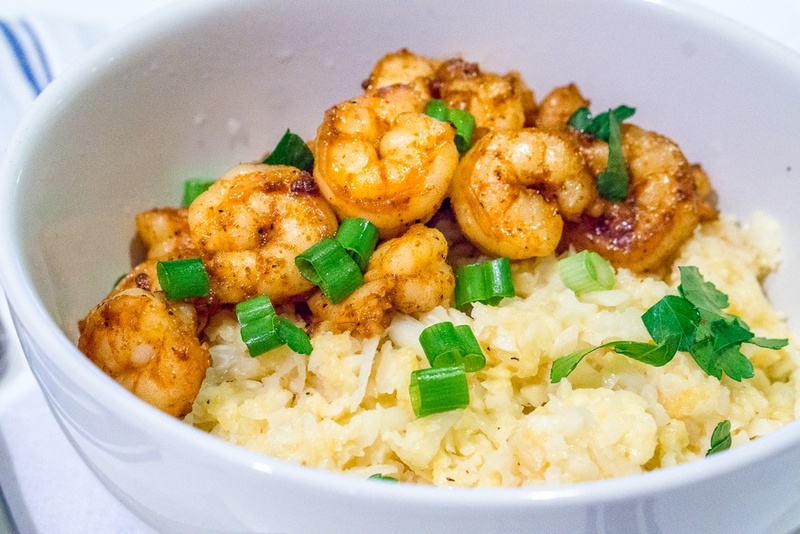 Serve the Cajun shrimp over the Cauliflower "grits" and garnish with scallions, chopped parsley, or cilantro.